I love a good butter cookie, and this one fits the bill - but it has more than just buttery goodness to offer. It has a delicate coconut flavor and a great texture, too. This recipe is adapted from one at Lavender and Lovage. The original cookies are made crisp, but by cooking just a tad less and adding a chocolate chip, you can have a tender cookie instead. The choice is yours! The soft version is the clear winner with my husband and kids, but try them both ways and decide for yourself. 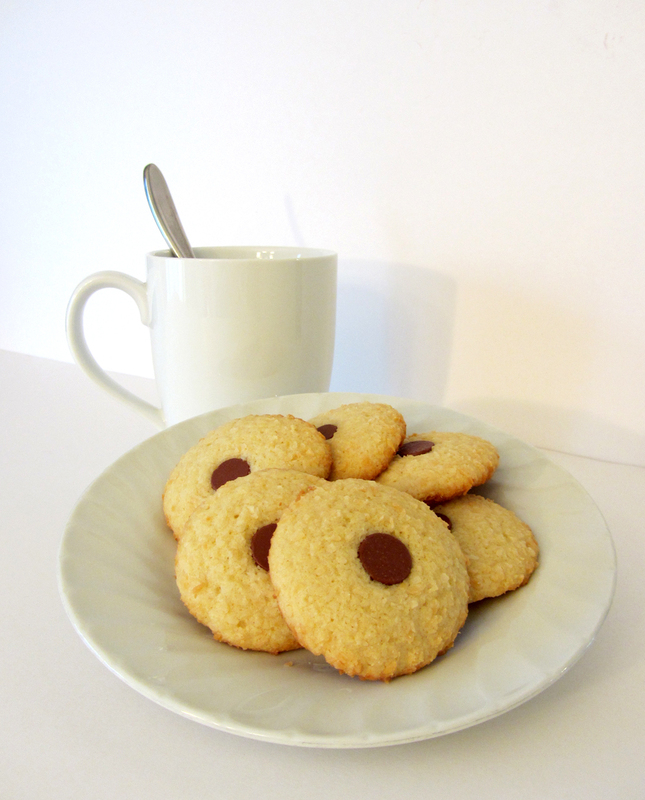 Whether you're looking for a accompaniment for tea time or just wanting to enjoy a tasty cookie, these are a nice choice! 2. In a medium bowl, whisk together the flour, baking powder, and salt. Set aside. 3. Combine the butter and sugar in the bowl of a stand mixer. Beat until light and fluffy. 4. Beat in the egg and then the extract(s) until thoroughly blended, stopping to scrape down the sides and bottom of the bowl. 5. Stop the mixer. Pour in the dry ingredients. Mix on low until the dry ingredients are just incorporated. 6. Place the coconut in a bowl. Scoop tablespoons of the dough (I used a 1" scoop), a few at a time, into the coconut. Turn the balls to coat evenly. Place the balls onto the baking sheets, leaving about 2" between each. 7. If you want a crunchy cookie, do not use chocolate chips. Otherwise, place a chocolate chip in the center of each dough ball. Use the bottom of a glass, measuring cup, or meat pounder to flatten each ball a bit (about halfway). 8. Bake for 8-10 minutes or until the edges are golden brown (for a very crisp cookie, bake until the tops are just golden, being careful not to burn the bottoms). Transfer the sheets to racks. Let the cookies cool on the sheets for one minute. Transfer the cookies to racks to cool completely. *The chocolate chip cookies may be a bit crisp at first, but will soften up as they cool.